In the xy-coordinate plane, line m is parallel to the x axis, and it passes through the point (4, -7). Which of the following is an equation for line m? Read the problem carefully. Take careful note that the line in the question is parallel to the x axis. Identify the bottom line. equation for line m = ? Attack the problem. We need to use the point-slope formula, but to do so, we must determine the slope (m) and the y-intercept (b). It makes it a little easier to explain this problem if we draw out the line on the coordinate grid, but you do not have to do this step. As the illustration shows, line m is parallel to the x axis, which makes it is a completely horizontal line. A horizontal line has a slope of 0. Think about it: if the y value never changes, then the change in y is zero, and no matter what the change in x, 0 divided by anything is 0. Since you know that the y value never changes, you also know the y-intercept will be (0,-7). Plug these values into the point-slope formula. Emmanuel owns a printing business. He ordered boxes of copy paper for $10 each and boxes of photo paper for $12 each. If Emmanuel ordered 10 boxes of paper and spent $112 (before tax), how many boxes of photo paper did he order? Read the problem carefully. Be careful to identify the correct bottom line- which type of paper is the problem asking about? Identify the bottom line. boxes of photo paper = ? Assess your options. At Knowsys we call these problems “How Many? How Much?” problems. To solve these problems, you can test out each of the answer choices, or you can create two simultaneous equations. Unless the first answer choice you test out is correct, the latter strategy will save you time. Attack the problem. Create two equations. One should tell you “how many,” as in “how many boxes of paper are there total?” The other equation should tell you “how much,” as in “how much do the boxes of paper cost?” We will use c to represent copy paper and p to represent photo paper. The 10 and 12 in the second equation are the prices of each box. The next step is to eliminate the variable that you are not focusing on, in this case, c. To get rid of 10c in the second equation, you need to have -10c in the first equation, so multiply the entire first equation by -10 and then add the equations together to solve for p.
Loop back. Did you solve for p (photo paper)? Yes. In the figure above, what is the sum, in terms of a, of angles b, c, d, and e? Read the problem carefully. Notice that the image is drawn to scale because it does not indicate otherwise. Identify the bottom line. b + c + d + e = ? Assess your options. If you find yourself stumped on a triangle problem on the SAT, run through the facts and rules you know about triangles and determine whether any of this knowledge applies to the problem at hand. 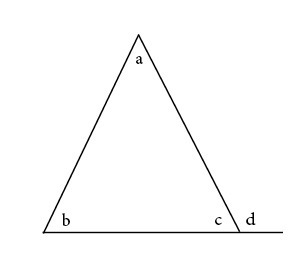 This problem is categorized as a “hard” level problem, but knowing one simple fact about triangles makes this problem easy to solve. FACT: The exterior angle d equals the sum of the opposite interior angles a and b. So, d = a + b.
Loop back. You found the solution to the bottom line. Read the question carefully. This question requires you to know exponent rules. It is important for you to note that a and b are positive integers and that you are asked for a in terms of b.
Assess your options. Unfortunately, this problem is going to be difficult for you to solve if you have not memorized exponent rules. If the rules you need to solve this problem do not immediately pop into your head, go back and review the exponent rules. Now you can apply the second rule. If the base is 3 on both sides, then the exponents must be the same number. Set them equal to one another and solve for the variable. Loop back. 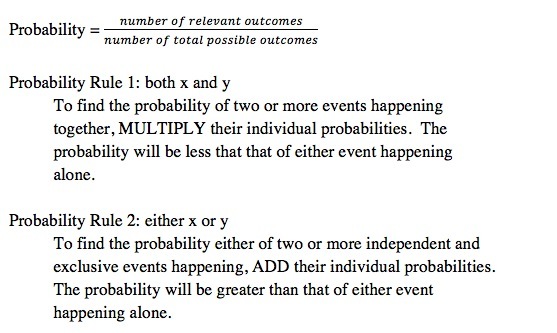 You found a in terms of b, so now you just need to select the correct answer choice, which is (B).